We all use barcodes and mobile phones every day when going about our normal routine, but few of us realise the potential for using them together. At the moment, although mobile phones are becoming more sophisticated and universally owned by people ranging in age from primary school children to great grandparents, barcodes are just the black and white stripes on packets. Or are they? An amazing thing has happened to barcodes in just the last 5 years or so. Designers have devised 2D barcodes that look a bit like ink spot prints. However simple they look, they are extremely complex and can carry enormous amounts of information. 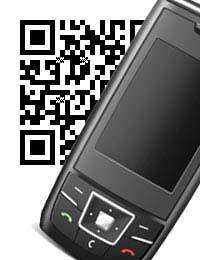 2D barcodes are already very popular in Japan and elsewhere in Asia, where mobiles are even more common than in Europe. Imagine that you are travelling through a Japanese city and you are looking for an apartment to buy. You drive around and see an area you like – looking up, there is a billboard with an inkspot-type picture – a 2D barcode. If you take a picture of the barcode with your mobile phone, the image is then converted by software on the phone into a stack of detailed information about the apartment that is for sale. It gives the price, the number of rooms, the dimensions, even pictures of the rooms. And the details of the agent, so that you can arrange to view. Instead of just seeing ordinary barcodes on the back of food packets for pricing at the checkout, it is now becoming more common for shops to have barcodes near the entrance. Take a picture and you can see all of the latest offers, things that are in the sale, opening hours and all sorts of information, straight on your mobile. Soon the technology will be available that you will no longer even need to take a picture. Just by tapping on the wall of the shop, the barcode is transmitted to your phone and read, giving you the same details instantly. Some of the people in mobile phone development are making use of the 2-D barcodes to put on their business cards and in newspaper and magazine adverts. The barcodes are small and take up very little space, so less advertising costs, but taking a picture with your mobile will send you straight to the website of the owner or the business card, or will send you to the website of the company doing the advertising. An exciting application of 2D barcodes is that they may soon replace tickets for cinemas, theatres and shows. When you buy a ticket for an event online, you either get the tickets posted on to you, or you pick them up when you get there. In the latter case, you could arrive to find your tickets have gone to someone else. But, if you ticket is a 2D barcode sent to your mobile, containing all sorts of encrypted information, just showing your mobile at the desk means you can get entry to the event. Of course, the technology is not fool proof – you have to remember to have your phone charged up. A dead battery means you would be turned away at the door.